French painter François Boucher (1703-1770) produced many of the images we have of the enigmatic Jeanne Antoinette, Marquise de Pompadour, Maîtresse-en-titre, or official Mistress of King Louis XV (1710 – 1774) of France. 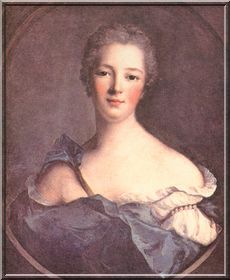 The daughter of a local beauty, Louise-Madeleine de la Motte and her husband François Poisson, Jeanne Antoinette Poisson was born at Paris in 1720. At that time the city was really little more than an overgrown village, bearing very little resemblance to the vibrant and beautiful place we know it to be to-day. The narrow streets were noisy and dirty and if it rained , you could not walk in the street without getting mud up to your knees. Her father was a jolly fellow and bore the brunt of all the jokes about their name, which meant fish. A steward to the Paris brothers, who were in charge of the economy of France, he was made the scapegoat in a black market scandal and was forced to flee to Germany where he remained in exile for nine years. Her mother, a reputed beauty, was rescued from her misfortunes by M. Le Normant de Tournehem one time ambassador to Sweden, a Director of the Compagnie des Indes, the collector of indirect taxes and friend of the Paris brothers. Jeanne-Antoinette, together with her brother Abel, was educated by de Tournehem. When she was nine her mother had her fortune read and she was told that she was destined to reign over the heart of a king. Following that her family playfully called her Reinette and set about ensuring that she received a worldly education under the watchful eye of de Tournehem. By the time she was in her late teens she was able to act, dance, sing, recite whole plays by heart and play the clavichord to perfection. She was an enthusiastic gardener and botanist and knew all about the wonderful shrubs pouring into France from all over the globe. Her handwriting was beautiful and legible and she painted, drew and engraved on precious stones. She was last but not least, a superlative housekeeper. Accomplished and beautiful, honesty and truth were said to be mainstays of her character and she was known never to have told a lie. Jeanne Antoinette charmed everyone, her family adored her and the only stumbling block throughout her life was her health, which was very delicate. Her brother Abel said that not one of her portraits rendered by Boucher was really like her. So she remains to history an enigma in that respect. What we can assume is based on the documented evidence of people who surrounded her. They said she was lovely with eyes that sparkled with life. When her father did finally return from exile the two families of Poisson and Tournehem lived happily together. 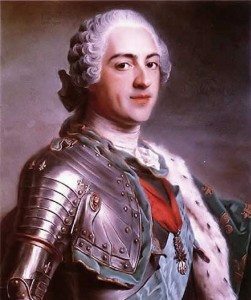 In 1741 aged 19 both families agreed to marry Reinette off to Tournehem’s nephew Charles-Guillaume Le Normant d’Étiolles because protocol demanded a mistress of the King was married. Although reticent at first after Charles had met her he fell promptly and madly in love. She promised that she would never leave him, except of course for the King, because she completely believed in her destiny. They were gifted an estate at Étiolles (28km south of Paris) as a wedding gift from her guardian. It was sited on the edge of the forest of Sénart where the king hunted. Her young husband was infatuated with her and she was celebrated in the fashionable world of Paris. Invitations into the best society were available and she founded her own salon at Étiolles where she met many of the great philosophes. They included writer, essayist and philosopher Voltaire, who noted that she was always amiable, charming and very talented. After many miscarriages and the loss of a son she gave birth to a daughter Alexandrine, who became the light of her life. 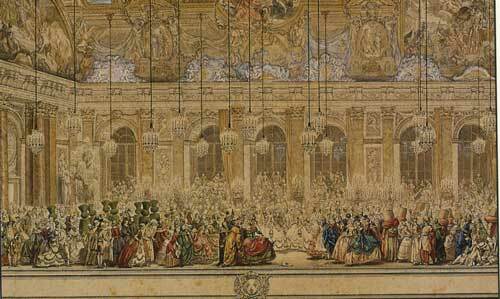 At Versailles, where gossip thrived, the King, Louis XV soon knew her name and she set out to make sure he would also know her by sight. 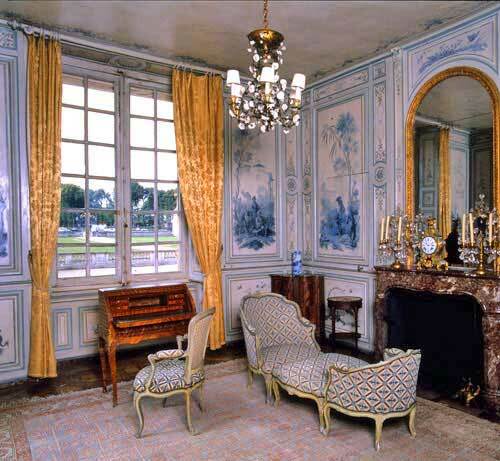 Louis XV’s hunting lodge was called Choisy, where he went for privacy and fun. 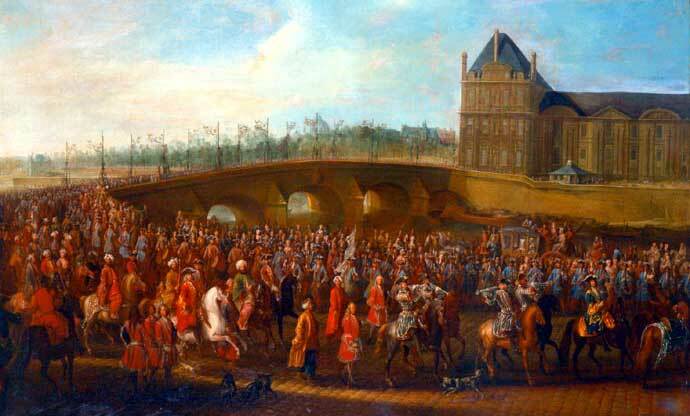 Although the bourgeouis were not allowed to ride in his hunt, the rule was relaxed for near neighbours so they could follow the hunt in their carriages. Reinette not content with riding behind the hunt instead reputedly drove across the path of the king a vision of loveliness and outrageously for a lady, standing up dressed in pink while driving a blue phaeton or, the next day dressed in blue while driving a pink one. The strategy worked because the King did not fail to notice her. His present mistress also noticed and she was warned away. However fate was on her side and took a hand when the current mistress died suddenly. The gossip about who would replace her was rife at court and the King, it was rumoured, was bored with temperamental aristocratic ladies. 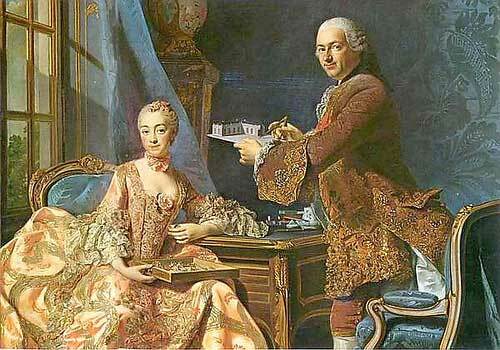 On February 1745 the Dauphin of France married the Infanta Marie Therese Raphaele of Spain. At a splendid ball in their honour everyone waited for the King to appear when out of his apartment trundled eight people dressed as eight yew trees clipped like those in the garden in the shape of pillars with vases on them. Louis XV was disguised as one of the yew trees, having fun and travelling incognito. 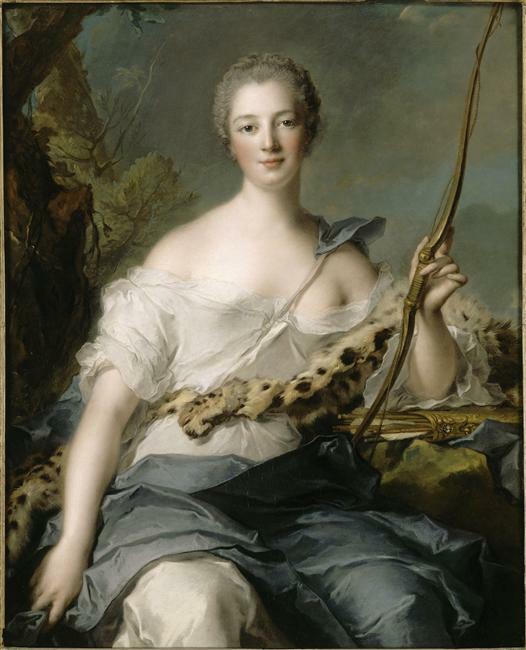 However during the course of the evening he was reputedly seen unmasked laughing happily with Reinette who was dressed as Diana the Huntress. Bets were quickly laid as to when, if, or when he would bring her to Versailles as his mistress. The official King’s mistress had enormous power at court. No one would believe a member of the bourgeouise, as Reinette was, would learn all of its political intricacies, which relied on not only words and deeds but also stifling rituals. But carry it off she did in great style and it was reported that when her husband was told he fainted dead away, but she was never to return to him and he became very bitter towards her. Versailles in the eighteenth century was a pleasure palace and the stiff formality of Louis XIV’s court had given way to an atmosphere of informality. The great monument to Louis XIV still radiated cheerfulness but life was for pleasure and most particularly for being in, and making love, for gambling, hunting and other official entertainments. 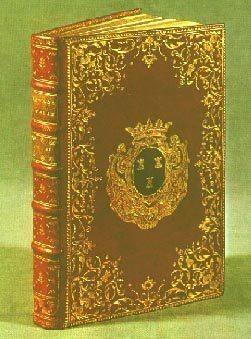 Red morocco binding with Madame de Pompadour’s arms. Love just like everything else was subjected to man made rules, and the game always had to be played according to the rules. Louis endowed Reinette with the title Marquise de Pompadour and gave her the title deeds to an estate of this name bearing her own coat of arms – three castles on an azure ground. Pompadour rhymed with amour, so her happiness was complete. 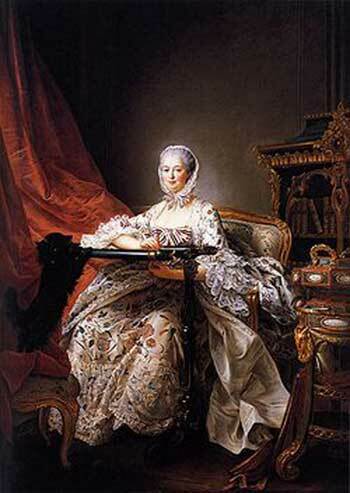 She was installed in private apartments at Versailles (recently restored) and began her reign of nearly twenty years. Her life was about organising his life, which meant it had to revolve around pleasure and she was very happy with him. A private staircase led from his apartments to hers, which was always filled with people, animals, birds, pictures and curiosities of all sorts, stunning small pieces of furniture, plans, lively sketches, maps, her beautiful embroidery, her letters, her cosmetics and with the flowers she loved. Her vast library contained 3,525 volumes all bound in leather and gilt with her coat of arms. 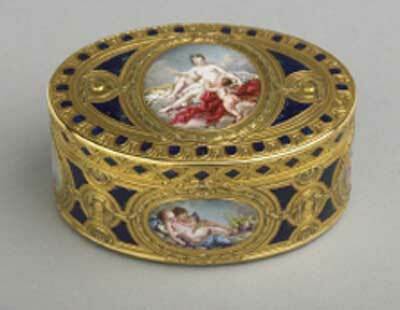 This gold and enamel, chiselled, chased and engraved snuff box was made 1764-1765 by Louis-Philippe Demay (active 1758-1772) Goldsmith. It shows miniatures of two paintings by Boucher, which Madame de Pompadour commissioned for herself. On the top is L’Amour désarmé where Cupid implores Venus to return his bow and arrow, and on the bottom the Toilette de Vénus, which she hung in her bathroom. The latter was not even available in engraved form when this box was made, suggesting either she, before her death in 1764, or her brother on inheriting the two paintings, commissioned this box from Demay. Jeanne Antoinette loved to acquire houses and then expend energy, taste and knowledge on embellishing them. The hermitage at Versailles was a rustic one storied pavilion with a wonderful garden arranged for scent so that one heavenly smell led to another. She had fifty orange trees, lemons oleanders, myrtle, jasmine , gardenias and tuberoses, olives, yellow jasmine and lilac from Judea, pomegranates in straight avenues with trellised palisades leading to bower of roses surrounding a marble Apollo. The interiors were simply decorated with hangings of cotton and simple furniture of painted wood. The King would pretend he was going hunting leaving the palace booted and spurred and spend the whole day there with her, sometimes cooking supper for himself. She had a farmyard with cows, goats, hens and a donkey, supplying milk for her weak constitution. She had to be dressed, as though for a ball by eight each morning then attend mass in an unheated chapel, and during the day she would not have one moment to herself. 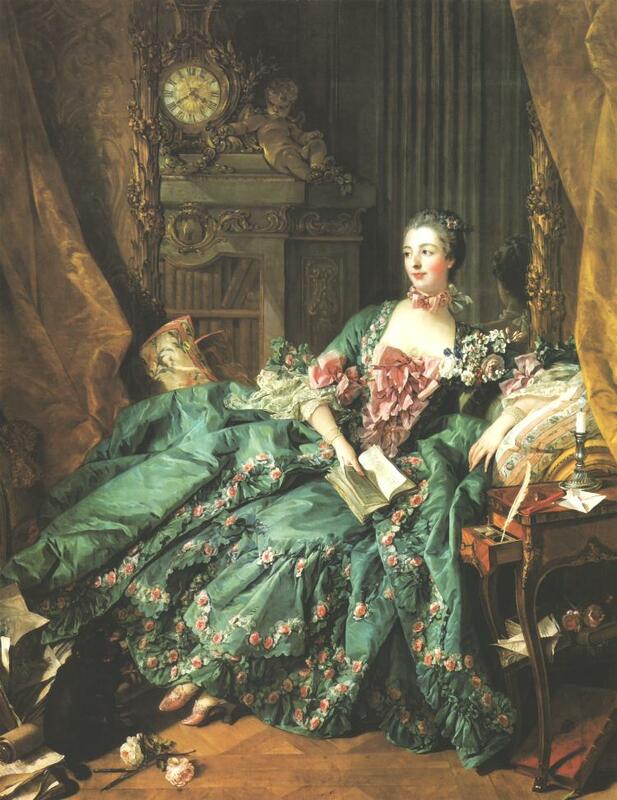 She was very proud of the nape of her neck and had Francois Boucher record it in what is probably the most stunning painting we have of her in her apartment, wearing her most beautiful sea green silk dress trimmed with copious pink roses. Reinette paid court to the Queen, received a succession of visitors, handwriting sometimes as many as sixty letters a week and arranging and presiding over supper parties nearly every night. At least once a week she would arrange a voyage of one or two nights and hold a party to entertain guests in houses often filled with workmen where improvements or landscape gardening was in progress and needed her supervision, and it often proved too much for her delicate constitution. 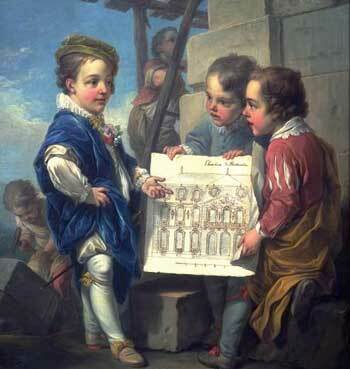 The Duc de Richelieu, First Gentleman of the Bedchamber organized the palace entertainments, which hardly varied for fifty years, so it was to the Marquise Louis looked to for light relief from the tedium of his life and she did not disappoint him, often organising her own private theatricals. The rigours of her day imposed a great strain on her health as she was seldom in bed before two or three in the morning. All the houses she furnished and embellished for the King had a perfection of taste with a great attention to detail and accounts survive attesting to that fact. The only original painted decoration surviving today of hers is at the Chateau de Champs – Sur – Marne. The decorations she put in place cost 200,000 livres in a matter of three years the works probably designed by her personal architect Jean Cailleteau (l’Assurance) as in all of her residences, she had a profound influence on style. These panels were painted with beautiful arabesque work by Christopher Huet, the last work he did before he died. The only house of any size Reinette built for herself was her Chateau Bellevue. Contemporarily it was described as the most perfect example of French domestic architecture. Designed and built for her under the supervision of Jean Cailleteau (l’Assurance), who had studied at Rome, by order of the King it had nine windows on the front overlooking the river; marble busts decorated its simple facade, which was classically inspired and embellished with delicate refined rococo decoration. Inside were sculptures and vases by Pigalle, Valconnet and Adam, the panelling was by Verberckt with superb painted decorations by Van Loo and Boucher. The walls of her rooms were either bluish white and gold or painted in bright pastel colours by members of the famous Martin family. (vernis martin). She had Van Loo paint four images representing the arts; of architecture, of painting, of music, of sculpture, all of which were used as overdoors. The garden at Bellevue was a dream of beauty, filled with china flowers that had come from the porcelain factory at Vincennes and smelt like real roses and the King was very taken with them. The King also gave her the village of Sevres, which was just below her house at Bellevue, She installed the china factory, which was transferred from Vincennes so she could have it under her own eye and direction. 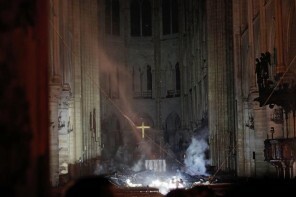 Here it prospered greatly, and many great artists and sculptors of the day worked hard under her guidance. The wonderful colours, Rose Pompadour, Bleu du Roi, Gros Bleu, Yellow and Apple green were invented; the shapes were original reminiscent of silver, with delicate biscuit figures by Pajou, Pigalle, Falconnet, Caffierie and so on and have indeed never been surpassed. 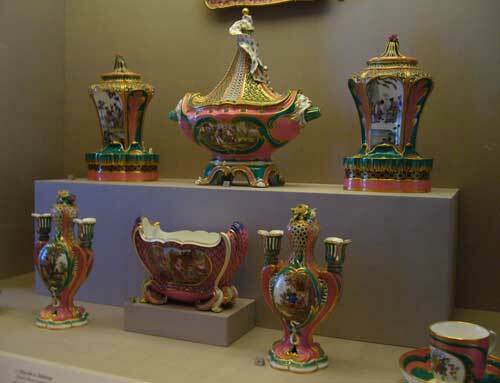 To French taste the products from Sevres porcelain factory were far superior to those at the German factory of Meissen. Once a year a china sale was held at Versailles and in a room in the Kings apartments, where he would often act as salesmen. Any bought during the period have proved an incredible investment. The Marquise loved to engrave precious stones. This charming craft has left us with a record of their life together and are now housed in the Bibliotheque Nationale at Paris where there are seventy of them altogether. 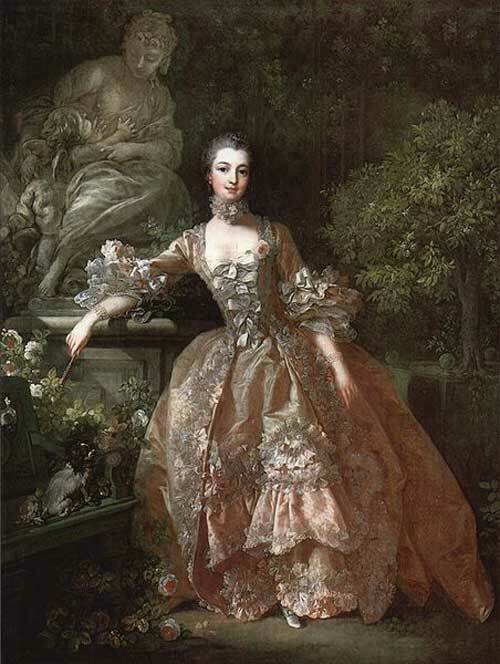 Boucher was official painter to Madame Pompadour, Van Loo official painter to the court and she looked after the artists that enjoyed her patronage and saw they were always paid and for that alone they adored her. From the moment of her arrival she directed and inspired everyone untiring in her efforts and quest for perfection and the result was that the arts reached a high point of excellence and beauty under her direct influence. For a long time she had unlimited credit as the King was happy to indulge her. He now shared her love for beautiful objects and they were a hobby he could enjoy and discuss in safety. His rooms were constantly altered and decorated and his visits to her rooms were exciting because there was always some new project on hand, with designs awaiting his approval, and things for him to purchase if he liked them. 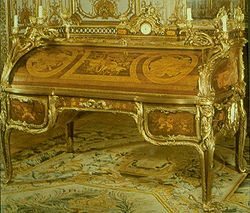 Her love of reading influenced Louis and his library in Versailles contained what has become the most famous piece of furniture in the world, his desk. Jeanne Antoinette knew stories to amuse him and they read the press together; she recited speeches by heart giving him an interest in the theatre in short she turned the dull boring life of the court into one long source of happiness the only sad side was sexual. Her health could not endure the continual love making which all the Bourbons seemed more than capable of, as it exhausted her. He is said to have ascended the stairs to her apartment sometimes nine times a day. She worried herself sick with the thought that he would leave her and the death of her daughter at the age of ten was a crushing blow from which she never fully recovered. She had many miscarriages trying to give Louis a child eventually destroying her health, and although he finally drifted away from her bed they remained strong friends and he visited her daily. 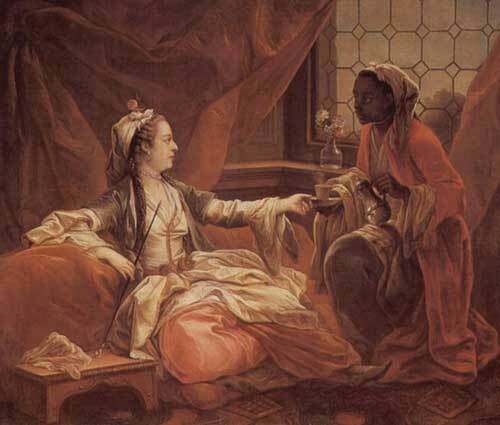 He took other mistresses like the notorious Irish Louise O’ Murphy also immortalised by Boucher. However he always discussed everything with Reinette and her greatest faux paux was involving herself in politics, which earned her the hatred of the people, the scorn of her enemies and many of the unpopular actions of the day were laid at her door. 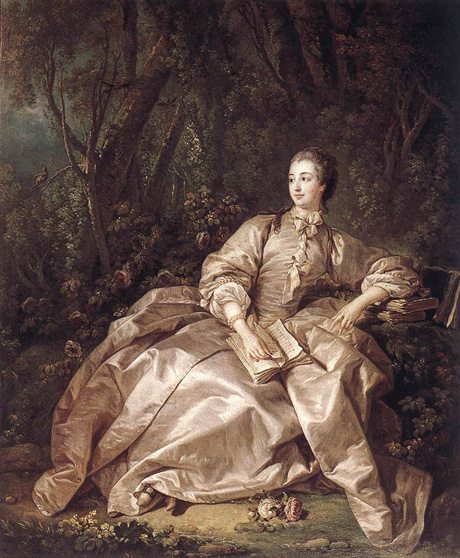 Mme de Pompadour realized a decorative style change relating to societal change from the frivolity of the rococo to the quiet elegance of neo classical architecture was inevitable. In 1749 when her brother Abel Poisson, the Marquis de Marigny left on a Grand Tour to Italy she gave him strict instructions to study classical ruins. She wanted to prepare him to take over the post of Directeur et Ordonnateur Général des Batiments, Jardins, Arts, Académies et Manufactures Royales, which he did in 1751 at the age of 25 and the department flourished under his management. 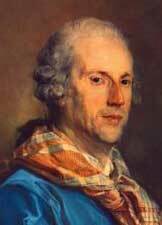 Louis XV chose architect Jacques Ange Gabriel (1698-1782), whom he had made Premier architect du Roi in 1742 to design the Petit Trianon in the grounds of Versailles. It was a building that broke right away from traditions established under the baroque and by way of contrast was a simple, prism with unbroken horizontal elements, relying completely on subtlety and restraint rather than a grand manner or effect. Louis built it as a pleasure palace for himself and his favourite mistress, however death would intervene before it was completed. In 1764 after an illness at Choisy the King brought Reinette back to Versailles where she made her will. He hardly left her room during her last days and not one word of complaint passed her lips. On Palm Sunday while the King was at church she sent for her priest and after hearing her confession he made to move toward the door. She is said to have called to him saying; ‘One moment M. le Cure we’ll go together’ and she died. Jeanne Antoinette was only 44 years of age. The protocol of the court said that the King could not attend her funeral. As the procession left for Paris the King reputedly stood on the balcony without coat or hat in a bitter wind until she was out of sight. It was reported that tears poured down his cheeks. ‘That is the only tribute I can pay her’, he was reputed to have said and, after she had gone a very great dullness fell upon the Chateau of Versailles. Her books testified to her wide reading interests from the classics to French poetry, popular novels, fairy stories, history, biographies, music, philosophy and the lives of famous writers. 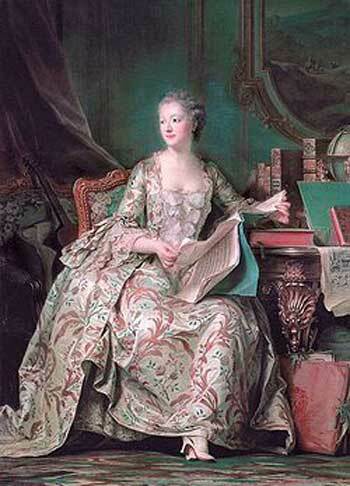 Jeanne Antoinette had been a woman of influence, as well as one of very great style. Previous articleL’Art Nouveau – A Design Style More than a Tendril in Time?